Roof leaks can cause serious damages to your home and sometimes it is difficult to point out the exact location of the problem. The stability of the roof should be a priority when buying or renovating a house. A leaking roof is dangerous to you home safety and destructive to other structures like walls and ceiling. Always be on the lookout for any leaking roof and call Waterproofing Singapore professionals for repair services. Even when the leak appears to be small, do not hesitate to call us. A leaking roof provides an entry point of water and moisture that can seep through the roof to the wiring system of the house. This is dangerous because the interaction of water and the electric current can cause a fire outbreak. Water leaks create a good environment for algae and bacteria to grow. It attracts the growth of molds that can cause serious health issues like asthma, inflammations, and respiratory related diseases. A leaking roof should be immediately fixed to protect the dwellers from such infections. A leaking roof allows water to reach the fiberglass insulation. Therefore, it becomes wet for a long time and requires a lot of energy to dry out. If this problem continues, it will result in a significant high energy bill. Unchecked roof leaks will cause serious problems to your ceiling, walls, and fascia boards. It also causes rotting of roof framings that begin to fall off. Therefore, the resale value of such a house will be affected. Also, due to such chronic causes of roof leaks, it will be expensive to repair all those affected parts, including the roof. When you notice your roof is leaking, call us. Do not wait until when the leak has caused too many detrimental effects. Roof leaks cause slippery floors that can make small children and adults slip and fall. This is a huge risk to the family because of the medical expenses for treating someone who has gotten a fracture. Repair your roof to avoid such hazards. 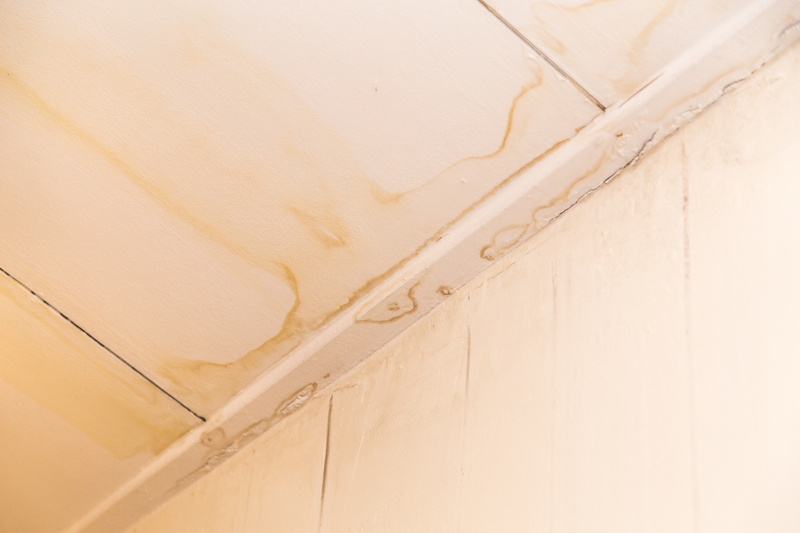 If the roof leak has stayed for a long time, it can lead to an outbreak of molds that affect your property like clothes, stored books, furniture, and carpets. Once the molds get into your house, it becomes difficult to evacuate them. You will need to hire an exterminator to remove them. Roof leaks do not just happen; there are common causes that lead to a leaking roof. You need to know them so that you can know how to protect your roof from leaking. All waterproofing membranes have a lifespan. Therefore, you need to reinstall a new waterproofing membrane to ensure the safety of your roof. If the membrane has outlived its days, it can allow water to seep through the roof because it is weak to act as a waterproof. If your gutter is clogged, water will accumulate on the roof for a long time and will start seeping through the roof. UV rays and standing water makes a waterproof membrane to be weak hence becomes ineffective. Also, the pool of water will find its way through the cracks and leak into your house. If you work with inexperienced contractors, this is likely to happen. If the membrane was not properly fitted, it would leave space for water to seep through the roof. It is important to always work with experienced contractors like the Waterproofing Singapore. We always ensure that the membrane is properly installed to cover the entire roof area. This one is easy to note by looking at the roof. If you notice some patches of missing shingles after a heavy downpour, you can tell that your roof is vulnerable to leaking. Sometimes you might find some pieces of the roof lying around your compound. You will need to repair your roof for home safety. Hire us today for roof repair services. We have the best team in Singapore that has high skills in leakage repair services.